Japanese Family Crest – it is only for the Royal Family and the nobles in the western world, the family crest. However, in Japan, every family has its own crest which is called Kamon in Japanese. Its design is unique, sophisticated, and each has its meaning. We will take a look at Kamon history, some famous samurai family crests and various scenes we see Kamon today. 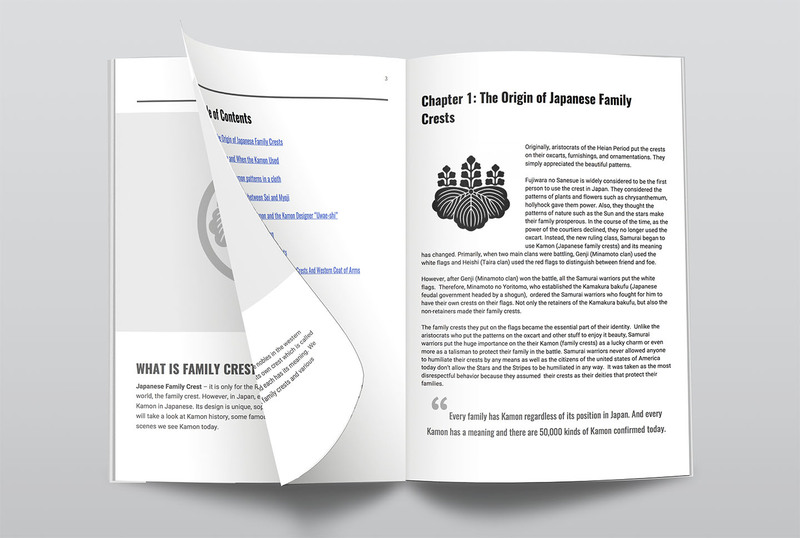 Given popular demand of searching family crest and roots, we have launched the Japanese Family Crest Consulting Service. We offer translation service, from Japanese to English and vice versa. We translate from personal items, documents/certificates, to family registers. Check out our interview with Mosho Uwaeshi, the Japanese family crest artisans in Tokyo. It is considered that Kamon was seen since the Heian period (794-1185). The nobles put beautiful patterns on various goods and they enjoyed its beauty. They began to create their own family crest, Kamon gradually. At that time, simple and natural patterns like flowers and plants were adopted. You were able to distinguish which stuff belong to whose family by its patterns of the crest. In Europe, only the privileged classes were allowed to have the crest. On the other hand, every family has Kamon regardless of its position in Japan. 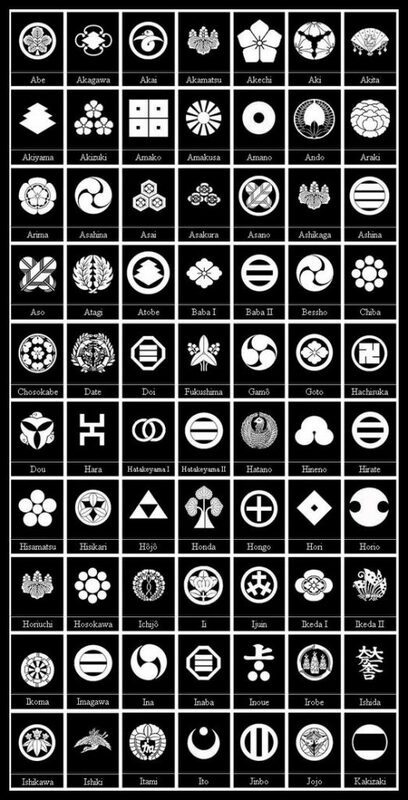 And every Kamon has a meaning and there are 5,116 kinds of Kamon confirmed today. Around this time, the family crest was only for the nobles just like the western society, but we entered the phase other class began to use family crest at the request of the period. At the age of Civil Wars, samurai began using Kamon as well. It is a well-known fact that Genji and Heishi fought the furious battle at the end of the Heian period; they used white flags and red flags to distinguish own troops and the army. Not just different colored flags but samurai started to have their own crest. In this era, in order to give rewards to samurai’s services in the battlefield accurately, there were people who were assigned to watch closely the battle and gave a report about who had done the most rewarding service. In this job, you have to distinguish each party precisely and Kamon came in very handy for this reason. The Edo administration ordered common people not to use a family name. For that reason, Kamon was needed to distinguish between own family and others among people. So the numbers of Kamon increased exponentially. In 1868, the class system was abolished by modernization, everybody was allowed to use a family name again. However, the culture of Kamon has stayed alive to the present. Let us introduce you two books about Japanese family crest. The first and the best book we recommend is “THE ELEMENTS OF JAPANESE DESIGN”. It is the best book for anyone who wants to have a comprehensive understanding of Japanese family crest. Detailed history and description of symbolism can make you familiar with these beautiful patterns. The second one is “JAPANESE DESIGN MOTIFS”, the catalog of kamons which includes 4260 Japanese family crests; it’s good to have a grasp of the richness of the variety of the kamon. You can enjoy many crests; if you just want to look at as many kamons as possible without detailed information, this is the one for you. 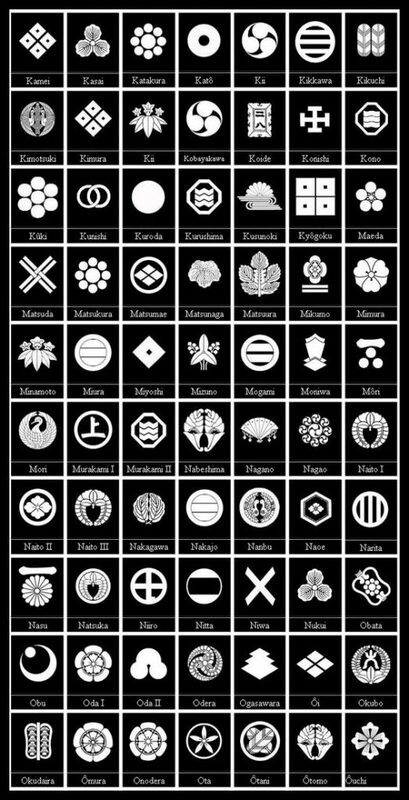 Japanese Design Motifs: 4,260 Illustrations of Japanese Crests It’s solid, it’s cool. That says it all. For anyone who wants inspiration for her/his designs. Sold on Amazon. Oda Nobunaga was a powerful daimyo (feudal lord) in the late 16th century who attempted to unify Japan during the late Civil War era. 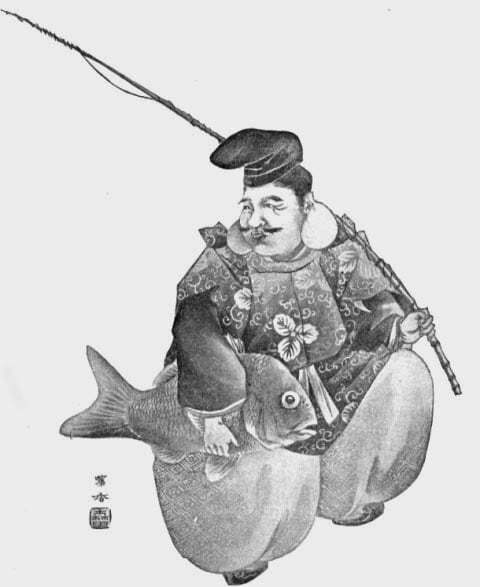 He is often regarded as ‘the first great unifier.’ Oda Family crest is ‘Mokko-mon’. Actually, that is one of the main family crests Nobunaga had, he had 7 crests. It is not very clear the origin of ‘Mokko-mon’, there are several theories like it’s a cross-section of a melon or some kind of flower. It also resembles the shape of a bird’s nest with eggs in it looking from above, therefore this Kamon is used in hope for family prosperity. Other six crests have their own meaning, here we take a look into characteristic ones out of six. It is originally the Kamon of Heike, but Nobunaga insisted he was from Heike, so he used it. Why he insisted it because it was believed the next conqueror would be someone from Heike, Nobunaga must have expressed his will through this Kamon. Nobunaga used this Kamon on his flags. Eiraku Tsuho was a coin which was imported from Ming Dynasty, it’s been circulated until the early period of Edo. Nobunaga was very active working on economic policy. Toyotomi Hideyoshi was a preeminent daimyo, warrior, general, samurai, and politician of the Civil War era who is regarded as Japan’s second ‘great unifier’. Toyotomi Family use ‘Kiri-mon’. Paulownia, which is “kiri” in Japanese, was believed to be the tree where a Chinese phoenix perches in ancient China myth. Around 800, the Imperial Family of Japan began using Kiri-mon on their clothing. In today’s Japanese government use this Kiri-mon, also we can find it on the Japanese 500 yen coin. After the Meiji period, the government began using it as a Japanese government crest. From the Imperial Family to the Imperial Court, then the modern Japanese government, this Kamon has always been the symbol of high status. Tokugawa Ieyasu was appointed to Shogun in A.D. 1603, and the Edo period began. Ieyasu was the third and the last ‘great unifier’. Tokugawa Family use ‘Aoi’ comes from Futaba-Aoi plant. It is originally from Shin-mon (deity’s crest) of Kamo shrine in Kyoto. The Shinto priest in this shrine, Kamo and groups of samurai in Mikawa had the close relationship. Ieyasu prohibited others to use this crest to keep its authority. Perhaps you can see Kamon most at ceremonial occasions such as a wedding ceremony or a funeral. We can see Kamon on Japanese traditional kimono, Tomesode, which is a women’s formal dress and Montsuki Hakama which is men’s formal dress. You have chances to see Kamon more often when you are in Kyoto. Stores like restaurants, confectionery shop which has been in business for many years, some of them are even more than 100 years have its own Kamon and usually put it on their curtain at the entrance which is called “Noren” and their wrapping paper. We see Kamon on wrapping cloth, too. Wrapping cloth can be used in a versatile way, it can wrap from fruit to wine bottle in it and still looks stylish and easy to carry. “Tenugui” is the cheapest and handy washing cloth you can own with Kamon on it. Also, you can see Kamon on a necktie, an umbrella, and roof-tile. It represents a certain family today as well. But people enjoy having their favorite samurai family crest on a key holder and as such. Sophisticated designs are inspirational and make everyday life feel special. A sure way to see a lot of varieties of Kamon at one time, you go to a cemetery and you’ll find them on the tombstones. The shrines and the temples have its crest, too. Shrine’s crest is called ‘Shin-mon’ as we have seen with Kamo Shrine, the temple’s called ‘Jin-mon’. Often times Shin-mon’s and Jin-mon’s patterns derived from its deity’s origin and tools used in rituals. 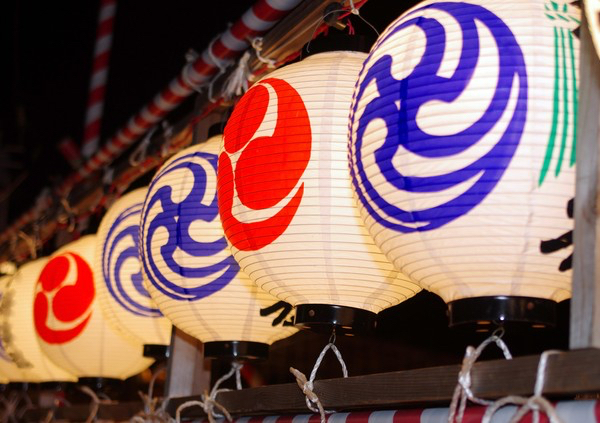 As you can see above, you walk near some shrine and if they throw a party, you have a chance to see such paper lanterns with Kamon on it. It would be interesting to find various patterns of Kamon on the street and look up the meaning behind it. I`m trying to find the Ishibashi family crest, but no success. Do you have any Idea Where I can find it? all my best wishes, From Brazil. Thank you for contacting us! So you’re looking for your Ishibashi family crest. Do you know where your family came from (Prefecture)? It’s quite unfortunate that we’re not taking orders of Japanese family crest research at the moment since we don’t have the resources with us now. We may be able to resume our practice in July, so please check us back at that time! Hi looking for Hayashi family crest. Thanks for contacting us! 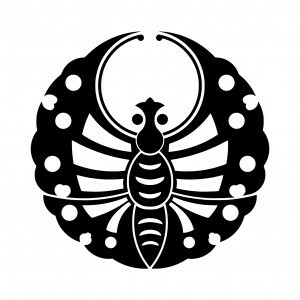 So you’re looking for the kamon of your Hayashi family, however, quite unfortunately, we’re not taking orders of the Japanese family crest research at the moment. We may be able to resume our practice in July so please check us out that time! What does mean “Fujiwara clan” family crest , but turned upside down, if it does make sence? I have it on my kimono, what I got as a gift from Japan. I really appreciate any info! 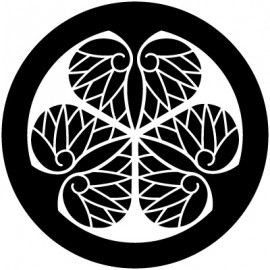 The kamon you mention here should be called either “Climbing wisteria” or “Hanging wisteria” (depending on the way from which you call it upside down) the crests designed with wisteria is somewhat related to Fujiwara clan for sure. Wisteria pattern represents a long-life, elegance, and reproductive power. 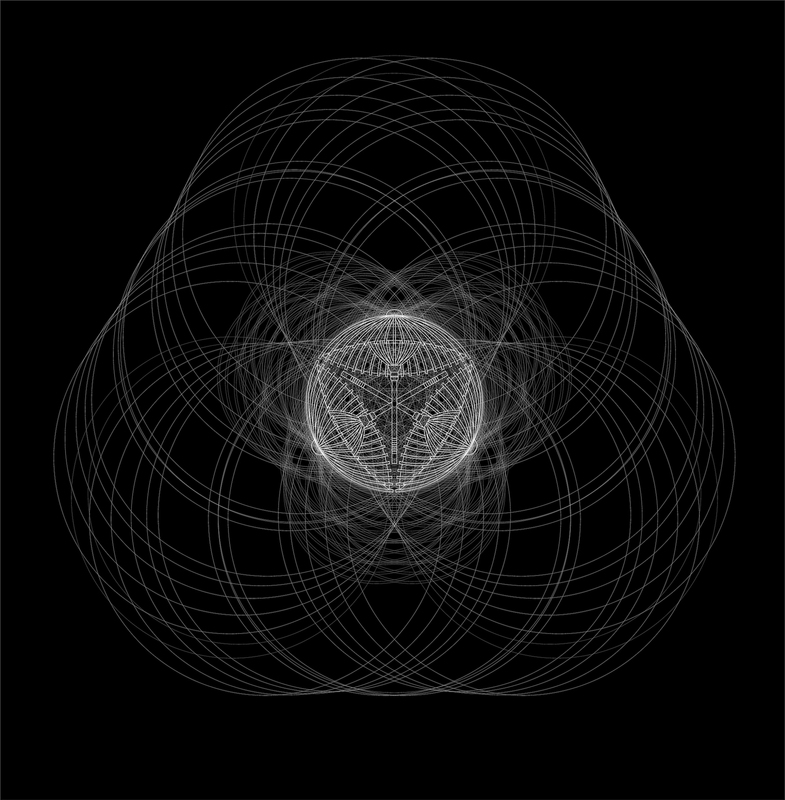 Many varieties of patterns exist including the upside down one. But interestingly enough, the closest families didn’t adopt the wisteria pattern as their crest since they didn’t really have to boast its bloodline as everyone knew they were close to the original Fujiwara clan. To sum it up, you can assume the former holder of the kimono or the owner should have been related to the Fujiwara clan. It’s something to see them in early May when they bloom in Japan. It feels like a dream walking under the wisteria. Hi, my surname is Shimada and my father is from Chiba. Does our family/clan have a crest? Is it possible that there could be more than 1 crest for each clan/family? Do all those having the same family surname are really related to each other? Thank you. Thanks for the comment! Every Japanese family has at least one kamon. So your family definitely has one, too. Sometimes they carry more than one family crest according to their history especially coming from the notable samurai ancestors (clans) since they held several crests for political and practical reasons. Having said that, it’s more common one family has one kamon but not more than that nowadays. And to answer your question whether the same family names are related to each other, yes and no. If one family name is really a rare one, chances are they might be related to each other, however, common family names have numerous origin and history all over Japan. So having the same family name doesn’t make them share the same family origin or crest. Hi my last name is Sakai (酒井), and my mon is the one pictured below “where you see kamon today.” I was wondering where you found this shop. Although we have immigrated from Japan five generations ago, I’m wondering if I’m distantly related to the shop owners. Thanks for the comment! 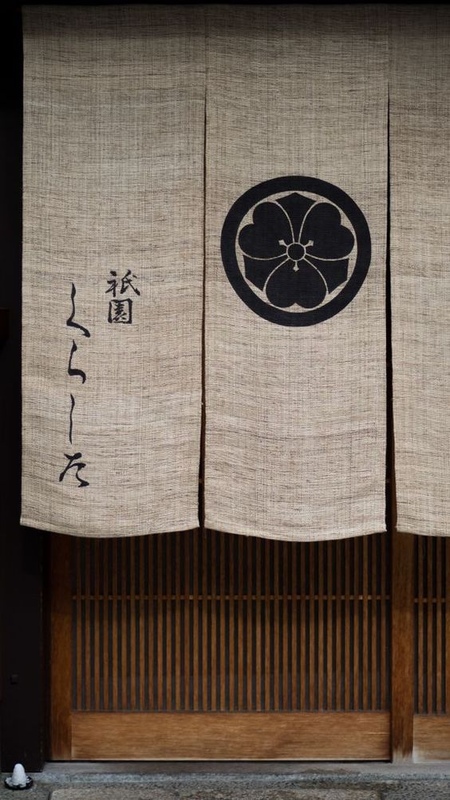 The mon you mention is called “Maru-ni Ken-katabami” (Wood Sorrel with Swords in a Circle) and it is one of the popular Japanese family crests, so it doesn’t necessarily relate to your family directly with this store in Kyoto. 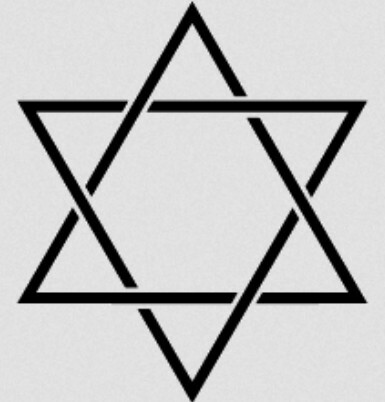 Even with exact the same kamon, origin and history can be totally different. So the important thing to know about it is where your family came from, and which clan or family yours are related. I am looking for the Kanakuri or Kanaguri family crest. Thank you very much! Research report orders at the moment. Please come back next July, we would resume our practice. I have a question about one pattern on my sword and I cant seem to find it any where could you help me ? Thanks for the comment! Could you send me the pic of the pattern on your sword via patternz.jp@gmail.com? So I may be able to recognize what that is. Seeking any information regarding my mother names Teruko Endo. Born in Sendai, Japan. She had sisters who were Professors in Universities. Sadly, do not know names. Thanks for giving us the comment! So you seek the information regarding your Endo family from Sendai. It’s quite unfortunate we’re not taking family crest research orders now, we’ll take orders again from Next July. Please come back next July and have happy holidays! Thanks for the comment! Unfortunately, we are not taking orders of the research report service and related matters. Please come back again next July and we’d be happy to help! I recently purchased a vintage black Tomesode Kimono, that was said to be at least 100 years old. Is it possible for you to tell me the clan that the Kamon on my Kimono would be from. I have a picture of the Kamon that I can send to you. Thanks for contacting us! If it’s 100 years old Kimono, it’s should have been produced at least in early Showa period or Taisho period. Did the seller tell you anything about the former holder? Yes, please send the picture of the Kamon on it. You can send it via patternz.jp@gmail.com. The possibility is we may be able to list up some related clans because samurai families often possessed more than one family crest. Looking to find our family’s mon. The name is Shimada. I always thought it was the wisteria pattern but i could be very confused anout it. Can you help? Thanks for the comment. So you’d like to confirm the family crest of yours which you think should be a wisteria pattern. We can help you with finding it out with our Research Report service. With a set of information, the family name (Shimada) and its domicile (Prefecture), we can provide the possible origin and history of your family and the kamon(s). Let us know if you find our service fit for you. I am actually from a Watanabe family, however, my Watanabe is this 渡部 and my symbol looks exactly like the one you mentioned but for 渡辺… and according to what my family and my ancestor has told me,, different kanji family name means different kamon.. and I saw my kamon today because I went to a Watanabe funeral today and I know what my kamon looks like but my kamon isn’t 渡辺’s kamon… can you please change the last name… please..? Thanks for the comment. As you’ve written, even with the same family name, they usually have several different kanji characters attached to it and they can have a different family crest. But it is case-by-case. Even with the same kanji characters, depending on the family domicile, they can have different kamon. We represent the family crests attached to each major Japanese family names just for the sake of readers as a reference. We have stated there is more than one kamon attached to each family name, however, it confused some readers. We will remove them. We really appreciate your comment as you gave us an insight. I’ve been wondering about my Kamon. Growing up there was multiple Kamon symbols in my fathers house of “maruni chigai takahona” We have one on the door, one that is framed and a whole bunch more. And after looking at this article I saw that the Kobayashi Kamon is different? I saw what you said about the same family name having multiple different Kamon but can one family inherit another families Kamon? Not sure if any past family was named Nakamura. I’ve just always been told that the “Maruni chigai takahona” was the symbol for Kobayashi. Thanks for the comment! I’m sure that your family crest is ‘Maru-ni Chigai-takanoha’ as that is the one your family inherited from generation to generation. The family crests we represented in the article are just representative ones with each family name and as we’ve stated in the article, there are a lot more kamons attached to each family name including yours, Kobayashi. We created the list just to show the examples and give a reader a sense of a set of popular family names with representative family crests attached to them. Sorry to make you confused! Although long ago in the Sengoku period (the 15 to the 16th century) and after, some samurai families carried multiple kamons for a political and strategic reason; they still used one kamon as their main family crest though. Was looking into my mothers maiden name Sakaguchi, would you be able to find a lead or crest for this? If you find it right for you, please let us know. Thanks for the quick reply, yes the kanji is 坂口 and by domicile, do you mean prefecture? if so it as far as I know it is 三重県. Hope this was helpful! Yes, we meant prefecture by domicile. Now we understand your family name is ‘坂口’ (Sakaguchi) and they are based in 三重県 (Mie Prefecture). My last name is Uda. I would like to know what the Uda Kamon is.. Thanks for the comment! Do you know your family domicile (Prefecture)? A set of information, the family name (Uda) and its domicile can lead us to know the possible family origins and kamon(s). Could you help me? My last name is Yamamoto, but I lost contact with my japanese family, I know that can exist differents kamons for one single family. Do you know which are that kamons for Yamamoto? Thanks for the comment! So you’d like to know the possible kamon(s) for your family. Like you said, there may be several or more kamons attached to the family name ‘Yamamoto’ depending on where your family came from. Do you know your family’s domicile? The birthplace (such as Prefecture)? We can narrow down the possible kamons with the information, a set of the family name and a domicile. You can check our Research Report service from here and if you find it good for you, please let us know. I highly recommend this service provided by Hiroko Matsuyama and Patternz. Getting information about the Matsunaga Family has been difficult since I never got to meet my great-grandmother or grandfather. Luckily with information from my mother and actually having a copy of the koseki, Hiroko was able to come up with three potential Matsunaga Clan lineage that my mother’s side may be related to. I have known that the tsuta-mon (ivy) was the kamon for the Matsunaga family but I still have to confirm that with my grandfather’s tombstone. This service is definitely a great start in helping me learn more about the history of the Matsunaga Clan. I will definitely update when I do more on the ground investigation when I move to Japan in the future. Hi Clement, I’ve been wondering why some illustrated representations of the japanese god Ebisu have a particular crest? Is it a thing for all gods or is Ebisu a special case? Does it signify that Ebisu belongs to this family or something like that? 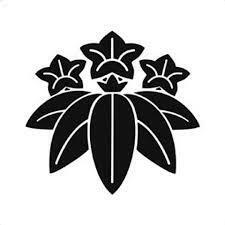 The crest Ebisu carries is called Mitsu’tsuru Kashiwa (Three Oak Leaves with Vines) and it’s only attached to him. He is the only one who has its origins purely in Japan among the Seven Gods of Good Fortunes (other gods have their origins in India and China). Ebisu is supposed to be ‘Hiruko’, who was born to Izanagi and Izanami, two deities in Japanese mythology. Ebisu Jinja shrines have Mitsu’tsuru Kashiwa (Three Oak Leaves with Vines) as their shrine crest so he carries the kamon. Oops! You sent this message to Clement instead of Jair, who should have been the recipient. My great grandfather was from Japan. The family name is Tetsuka. Is their a specific kamon for the family? I have seen some, but they seem very generic in appearance. Do you know your family’s domicile (birthplace) in Japan? A set of the family name and its domicile can narrow down the possible kamon(s) of your family pretty well. The Tetsuka family was involved in the porcelain manufacture and trade business in Arita early on, but I don’t know if they were actually from there. Supposedly, the family also owned Nippon china at one point, but that doesn’t really pin down their geographic location. We understand that. Arita town in Saga Prefecture is famous for excellent porcelain manufacture. it might be more than several possible origins, history, and kamon(s) unless we know your family’s domicile. Any chance you might get to know your family’s birthplace? Then we could help you narrow down the information for your family. I am afraid at this point it is a dead end. Should I receive further information I will certainly contact you. For now, many thanks for all your efforts. Sure, let us know if anything comes up! Thanks for the comment! 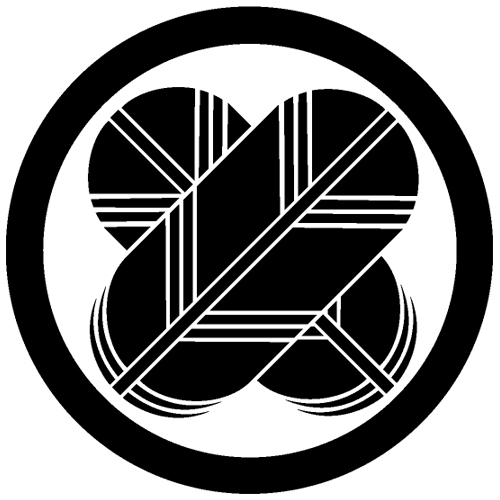 And yes, the kamon we are using as our PATTERNZ logo is exactly “Maru-ni Tsuta”! 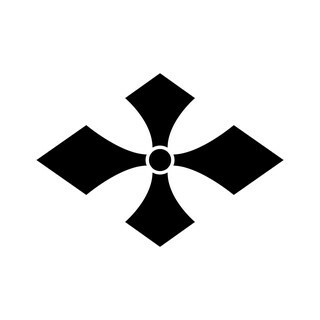 It doesn’t mean that every SHIMIZU family use the same family crest, however, the resource we have shows us some SHIMIZU families use “Maru-ni Tsuta” as their kamon which is connected to the line of a certain samurai family. We are trying to find the exact lineage for my wife’s family crest, it’s a partial circular shape, almost like the top of a Japanese fan. We cannot find anything on the internet for it. Her great grandfather was from the fukuoka prefecture and the Surname is Koga. Thank you for contacting us! We can help you find out the lineage of your wife’s family crest with our service. Do you have a picture of the kamon? Does it look like this? Dear Matsuyama San, We born in Brazil. There are many Japanese descendant families here. Could you kindly search about my wife’s family surname Fukumura (福村). Thanks in advance! Do you know the domicile of your wife’s family in Japan? That’d make our research more probable to find out the origin and history of Fukumura family and its crest. Looking to find out the Mon for Jinbo and also Nii. Could you please help. Thanks for contacting us! So you would like to know the kamon for Jinbo family and Nii family. Do you know each family’s domicile (birthplace such as region or Prefecture)? If you could provide us them, we may be able to find each family’s kamon(s), also the origin and history of each family’s lineage. You can check our services from here. Hi, i have a photo from an old gravesite in Japan with the mon on it. it like 4 separated diamonds in a circle. Most of the ones i have found online either have eyes in them or the diamond shape seems elongated. Can you help me? I can send a picture if u tell me how. Thanks!! Thanks for the comment! Sounds like you have a kind of Hishi-mon (the diamond pattern crests). Yes, we may be able to recognize what it is once you send us the picture. Please send it via patternz.jp@gmail.com. So I’m trying to find out about my mon. I don’t know which side of the family it belongs to. The names of those two families would be Sakato and Kondo. I was told one side has had samurai in it but I don’t know which one it is. 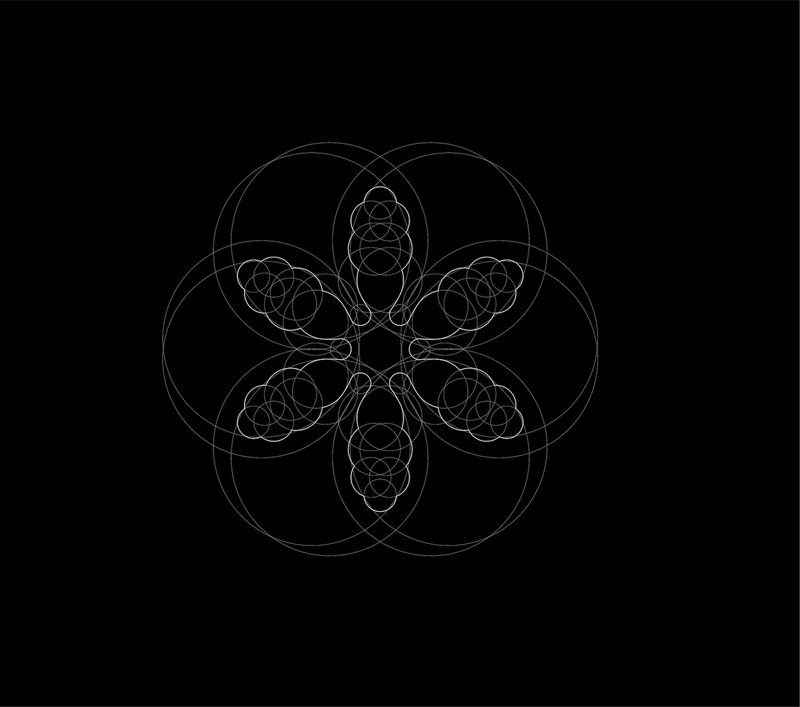 My mon is a four petaled flower with a circle in the middle. The petals are diamond shapes but stretched horizontally. I hope you can help me. Thanks! Thanks for the comment! Well, do you have a picture of that mon? If so, please send it to us with your name via patternz.jp@gmail.com. Let us give you what we could think of now from your description. Does it look like your mon? Oops, I sent you an image without a circle. Here it is the pattern with a circle. Hi my family mon is 5 circles in a + shape in a circle. Do you have any family information on this one? The kamon of your family is called “Maru-ni Itsutsuboshi”. It’s a quite rare crest but it has several possible lines we can dig into. With a set of your family name and domicile (the main birthplace of your family), we could provide more information about your family’s origin and history in general. Thank you, i will try to get more information on y grandparents. Hey so I’m trying to track some family history and I noticed the Toyotomi crest is on all the head stones of my relatives. Could you tell me why that might be? 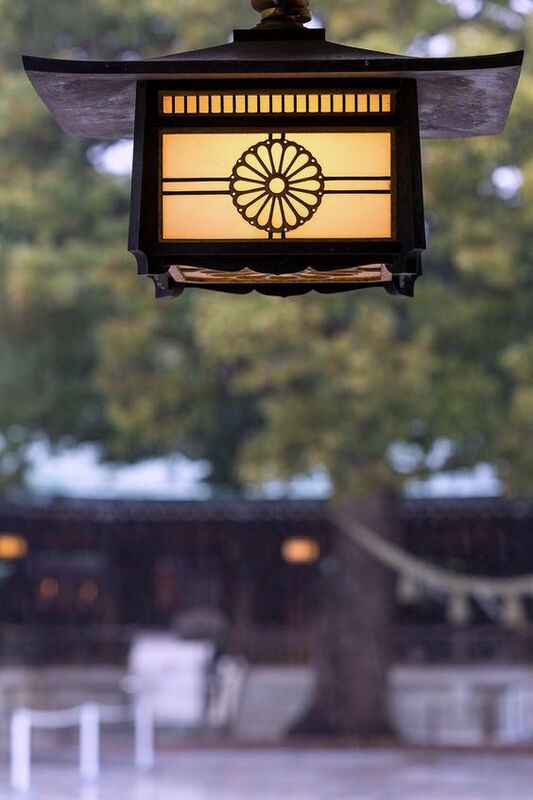 The paulownia crests have been given by Hideyoshi to his retainers who had offered great service to him. So there are many samurai families that use the paulownia crest as their family crest. Your family might have a relation to one of them, the retainers served Hidesyoshi. Thanks for contacting us! The crest you’ve mentioned, we can’t spot what exactly it is. 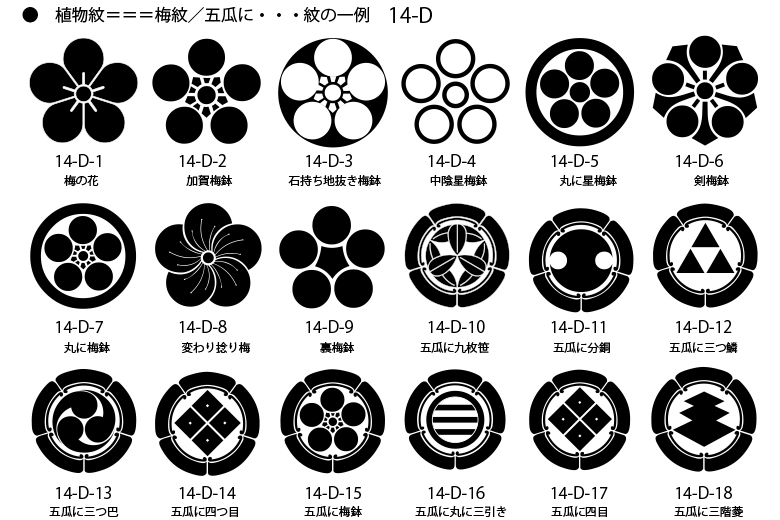 The close ones we come up with are Kagome-mon (reticular pattern) and Uroko-mon (scale pattern). Kagome-mon (reticular pattern) is used for a religious meaning of warding off evil spirits. The Uroko-mon (snake scale pattern) also has a religious meaning to protect one from evil. That’s all we know about it now. If anyone knows about this crest or the source of this list of crests, please contact us! My ancestry follows: Sosuke Yoshihiro; then second son Kaiemon Yoshirhiro born ?1855 in Yamaguchi Perfecture and took the name Sokichi Abe to avoid the ordered sepuku by the Emperor. Sokichi Abe married Nami ?. The family estate was turned into a resort hotel located on Hikoshima Island. My great grandmother had the swallowtail crest on her kimono. My great grandfather is Rinnosuke Abe and he lived in Fukoaka. Would be able to find out any history of my family? Thank you for contacting us and sorry for the late reply. Well, what we can provide is the history and origins attached to a certain Japanese family name and its family crest. We can’t research individual family history which would require a family register. Since your grandmother had the swallowtail crest, we could research on that, also on the history and the origins of the family name “Abe” from Yamaguchi. I know there are 6 showgun families… I hate Korean made phones sorry typo. I’m hoping you can help with my families crest. My Grandfather and Grandmother’s families are both originally from Okayama. His last name is Nishimura and her’s is Fujiyama. In turn my Mother’s last name is Nishimura. Hi nic, thanks for the comment! If you find it good for you, let us know. I just got back from Japan with my 84 year old mother and want to confirm our family crest. The family name is Seikii and she grew up in Yokosuka. I believe her father is originally from the northern part of Japan but I’m not certain. The family crest on the tombstone we visited at a shrine near Yokosuka appears to be 3 chrysanthemums with a small circle in the middle and we are looking for a clear image of the family crest. Hi Debra, thanks for the comment! We could help you with our consulting service http://www.patternz.jp/product/kamon-consulting/. with your family’s possible Kamon and family name origin and history. Let us know if it fits you. Hi Lisa, thanks for the comment! Please check out our consulting service and let us know if you think it’s right for you. My husbands family name is KURIKI. I am not sure where in Japan his family originated. We only know of the Kurikis that immigrated to Hawaii. Would you be able to find a kamon or history of this name? Thank you for providing any information you may have! Hi Nancy, thanks for the comment! Please check out our Kamon consulting service we’ve launched and if you find any of the service fit, let us know. Trying to find Hiromoto family crest and history. Family is from Hiroshima, Japan. Can you help? Hi Lorraine, thanks for the comment! Your family name “Hiromoto” has roots in Oe-uji which dates back to Hashi-uji that is considered to be descendants of Amenohohi, who is kami (deity) in Japanese mythology. Oe-uji produced a lot of talented poets and scholars so the Court gave them high positions in the Heian period (792-1185). One of the most powerful Oe-uji, Oe Hiromoto’s descendants flourished as Samurai family in various regions. One of them produced Mouri Motonari, the famous daimyo (warlord) in the Warring States in Aki-no-kuni which is present Hiroshima Prefecture. His family crest is “Ichi-monji ni Mitsu-boshi” (a horizontal line with three stars underneath). So that if your ancestors succeeded the crest from its line, this crest is your best bet. This is what we have found for the set of your family name and the place you provided for us. Hi. I do have a photograph of my family crest that was on a tombstone but unfortunately the image is not very clear. My grandfather, Kiyoshi Kuwahara, was from Miyahara, now Hikawa, in Kumamoto. 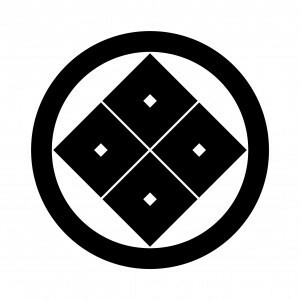 Is there a possibility to find a clear image of our Kamon and to know more about my ancestors? Hi Fuyiko-san, thanks for the comment! 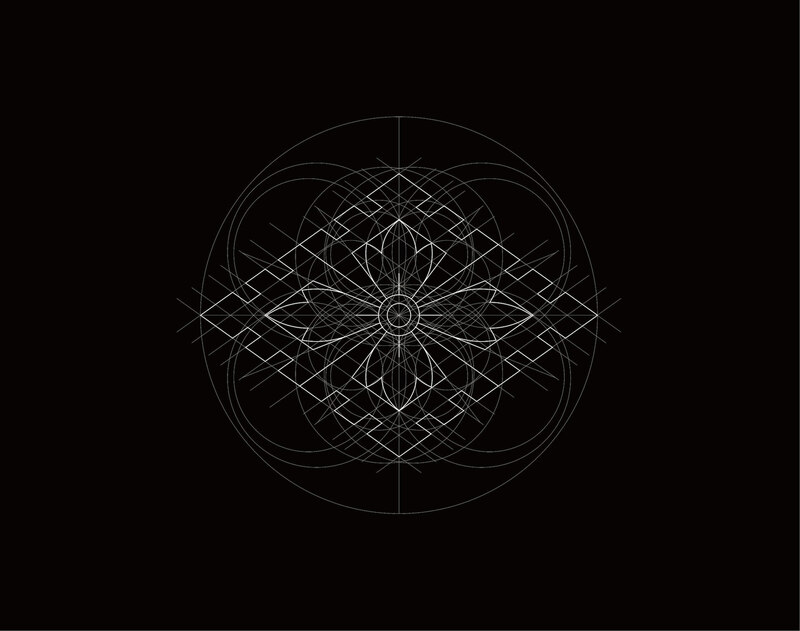 Could you send us the image of your Kamon here? Or you can send it via email http://www.patternz.jp/contact/. Hi. This was really cool to discover. My mom just passed in August and her family name is Yamazaki. Her family crest might be like the kyogoku pictured in the first part of the article. We have a kimono with that crest on the back and a couple of medallions that she said were the crest. Would you be able to relate any family history or tell me anything about it. Hi, Emily. Thanks for the comment! The crest which titled as “Kyogoku” in the article actually is “Yotsumeyui” which comes from a tie-dying method. The kimono you have with a crest on the back is perhaps a “Hitotsu-mon” (one crest) which you can wear at semi-formal occasions (say friend’s wedding party, tea party, etc…). The family name “Yamazaki” with Yotsumeyui-mon has a line of Sasaki family which roots can be traced back to Imperial Prince of Atsuzane (893-967). And he was the 8th son of Emperor Uda. Trying to find Mochizuki family crest and family history. Family came from Hiroshima. Is there a website to get this info? Hi Robert, thanks for the comment! To answer your question if there’s any website you can get this kind of info, we say yes to some extent if you read Japanese. Unfortunately, there’s no informative site you can check them in English as far as we know. what we deliver is authentic information. We use a lot of Kamon books and dictionaries as well. Now, let’s move on to your family name. Saku-gun (County), Shinano-no-kuni (present Nagano Prefecture). Mochizuki family is the descendant of Shigeno-uji (family) which was a powerful family whose roots can be traced back to Emperor Seiwa. 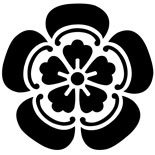 Mochizuki family crest is “Kuyo” (nine stars) –　九曜. It was believed to work miracles on road safety, so they put this crest on vehicles like an oxcart in the Heian period (794-1185). Let us share the story where did the family name “Mochizuki” come from. the full moon (満月/望月 – Mochizuki). It was one of the events of the Imperial court that many clans offered their horses to the court as a gift. The horses (Uma in Japanese) which offered by Shigeno-uji called “Mochizuki no Uma”, who was the major contributor and later the clans which took over its job to take care of the horses were given the family name “Mochizuki”. What is the Nomura Family crest? My family is from Mikata, Japan. Is there a website to get more of the family history? Hi Naomi-san, thanks for the comment! Is “Mikata” in Fukui Prefecture or Niigata Prefecture? The family name “Nomura” has several roots, pinning down the birthplace would help the research. We use https://myoji-yurai.net/ to search roots of Japanese family names. It’s only in Japanese. If you have relatives there, asking them to check the family’s tomb would give you the definite answer. Can you help me find my family crest and the meaning and history. My family name is Nomura. My family is from Mikata, Japan and some are still there. Do you have information regarding the Nomura family crest? My family is from Mikata, Japan. Where can I get some family history? My ancestral family name is Takei. They were retainers to the Asano Daimyo of the Hiroshima Domain. I am also interested in how you find a specific family crest. Is there a specific website? Hi George, thanks for the comment! 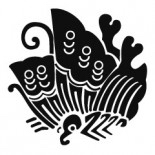 The Kamon of Asano Domain is “Asano Taka” (The Hawk Feathers of Asano). We use the site of “The Origin of Japanese Family Names (Japanese Only)” (https://myoji-yurai.net/) as a reference to trace back the roots of one’s family name. Usually, it has several lines and the candidates can multiply. So we take a look at each line and narrow down the possibility to find one’s Kamon using numerous sites and books of Japanese family crests and family names. We also use the books we introduced in our article, “Japanese Design Motifs” and “The Elements of Japanese Design” as a reference. Hi Deana, thanks for the comment! The Kamon which looks similar to a full moon, the closest one we can think of is “Tsuki ni Hoshi” (A star in a crescent moon). Could you give us some information such as where your family was or name of the Daimyo or retainer if possible? Trying to find out if there is a kamon for the Ishibashi family. Any help would be appreciated. My family (mother) was from Chiba. Hi Bill, thanks for the comment! Your family name “Ishibashi” has numerous roots as the name suggests “Stone Bridge”, which is everywhere in Japan as the important element for cities and villages. Since you have provided the information that your mother came from Chiba, we could say its roots should be traced back to the Minamoto clan. Yet the Minamoto clan has numerous lines, so we really can’t trace which is yours. we may be able to narrow down the candidates for your Kamon. I am interested in some background information and confirmation if possible. I have a tie clip with the “Matsunaga” symbol (5 paulownia flower leaves?) on it. I was told that this tie clip belonged to my great grandfather and that the symbol on it is our family crest. Our last name is Kishi and I believe my ancestors originated on a small island off the coast of Okinawa. Wondering if this is likely the correct Kamon and possibly some brief history? Hi Kody, thanks for the comment! Your family name “Kishi” has four main roots we can trace back. We assume your tie clip with “Matsunaga” crest represents 5 Japanese ivy leaves (it’s easy to be confused with paulownia leaves). It’s “Tsuta” (Japanese ivy) crest. Is this the one on your tie clip? If that’s correct, there is one line which uses “Tsuta” Kamon out of four lines. That is the line of Shiina family who ruled Etchū Province (present Toyama Prefecture) as a feudal lord. Their lineage goes further back to the line of Chiba clan of Kanmu Heishi (Taira clan originated from the Emperor Kanmu). 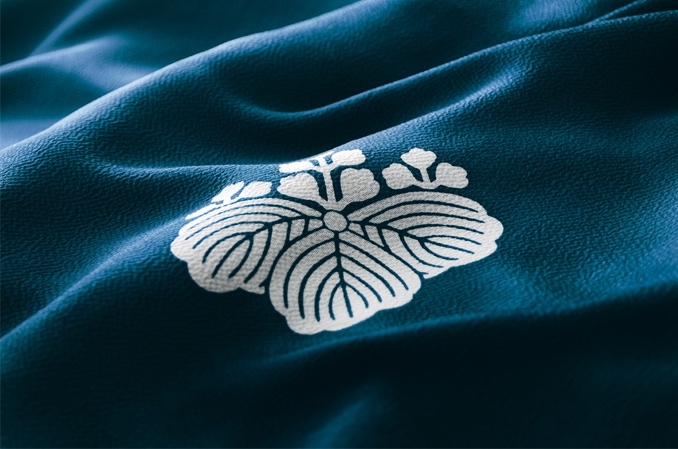 The “Tsuta” crest is one of the most popular Kamon for its beauty and it was first adopted as decoration on costumes and furnishings of the aristocracy. 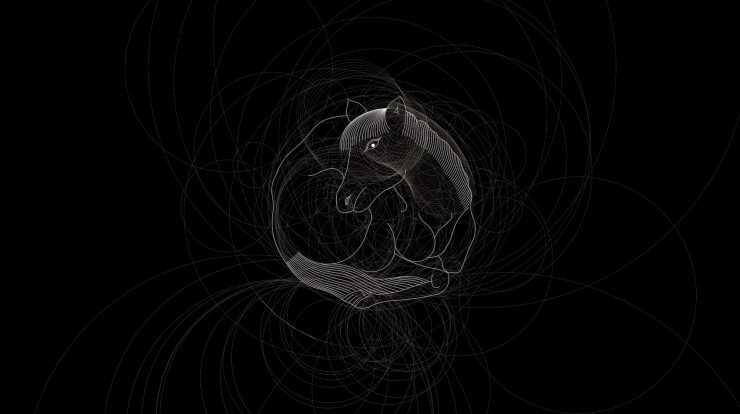 It symbolizes the ability to survive and prosper by entwining itself around other bodies. There are more than 500 varieties of “Tsuta” crest due to its popularity. Thank you so much for the quick and very thorough response! As you can see it is slightly different than the Tsuta symbol in the number of lines on each leaf. That symbol in the image is the exact symbol on my clip. Does this change or clarify anything? Thank you so much again, I can’t wait to share this information with the rest of my family! Thanks for the attached file which shows your family crest. Yes, there are slight differences but the significance is the same. That is the “Tsuta” crest which is really popular. Hope your family would find it helpful:)! Hi Jessie, thanks for the comment! Your mother’s maiden family name “Kurata” has two main roots. One is a line of Sasaki clan of the Uda-Genji (the Minamoto clan originated from Emperor Uda) in Bizen-no-kuni (present Okayama Prefecture). 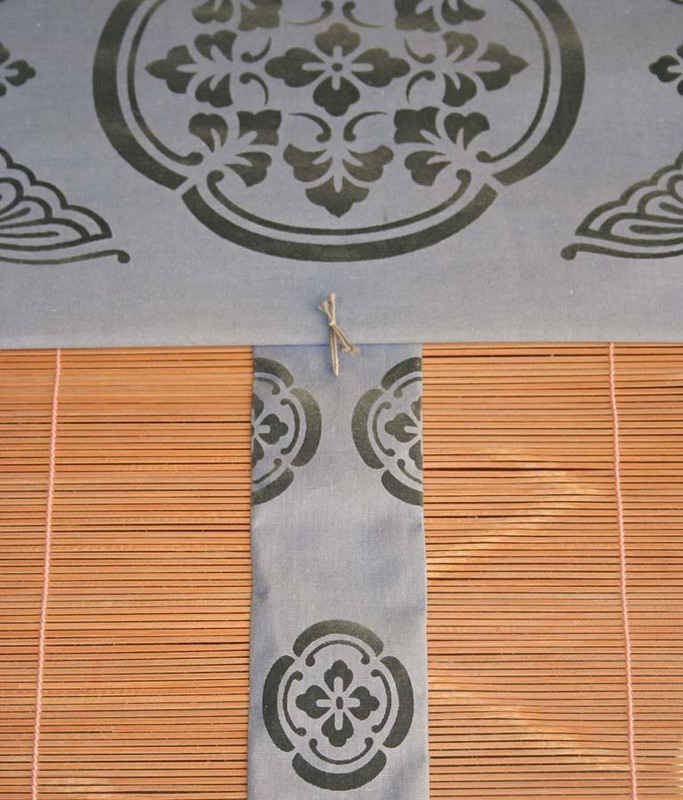 The representative kamon is “Yotsume-yui” (a pattern originated from tie-dying method). Another line can be traced back to Kodama clan of Arimichi family in Musashi-no-kuni (present Capital area, Tokyo, Saitama, and Kanagawa). The representative kamon is “Gunbai Uchiwa” (a military fan originally used as a sumo referee’s fan). you would be able to narrow down the possible kamon for your mother. Now, let’s move on to your daughter in law’s family name “Yikake”. It seems like a pretty rare one. Could you give us the kanji characters of it, if you know? Thanks for the quick reply, unfortunately, when my mother married a US serviceman in the 1950’s she was pretty much disowned by her family. I have never met any of my Japanese family members, I do know that my mother’s grandfather owned a farm and her father was a fisherman. Thanks for the information, Jessie. your grandparents on your mother’s side was working hard to recover from the war and build the country strong. Shikoku region has four Prefectures, each of them faces the sea and warm climate makes them produce veggies and fruits (especially Satsuma Mandarin in the South part) in varieties and bonito and tuna are the two main products of the fish industry there. Well, give us a time to look into your daughter-in-law’s maiden name “Miyake” from Kyoto, then we will get back to you! We’ve looked into your daughter-in-law’s family name “Miyake” and found it has at least six roots. And those six roots can be divided into numerous lines. the related family names, which might lead us to narrow down the possible candidates. The surest way to know the Kamon is to see their gravestone. My family name is Ikemoto, and I’ve been told our mon is the two crossed feathers, but I can’t find anything to verify. The research you’re doing here is amazing, and anything you find would be greatly appreciated! Hi Sueko-san, thanks for the comment! Before we begin our research, would you give us the kanji characters of your family name to clarify? 池本 or　池元? Are there some kamons with fish motif? Thanks for help! Hi Michal, thanks for the comment! That’s a really good question whether there is any fish motif kamon. The answer is yes, but very few. Unlike the scale motif kamon, the fish itself design is very rare. Here is a famous scale kamon, “Mitsu-uroko” (three scales) of Kamakura Hojo clan for your information. when it was the warring states to distinguish the enemy from ally. Samurai liked the designs which made them look strong, daring, and fearless. The fish motif didn’t live up to this image since they go rotten pretty quick. 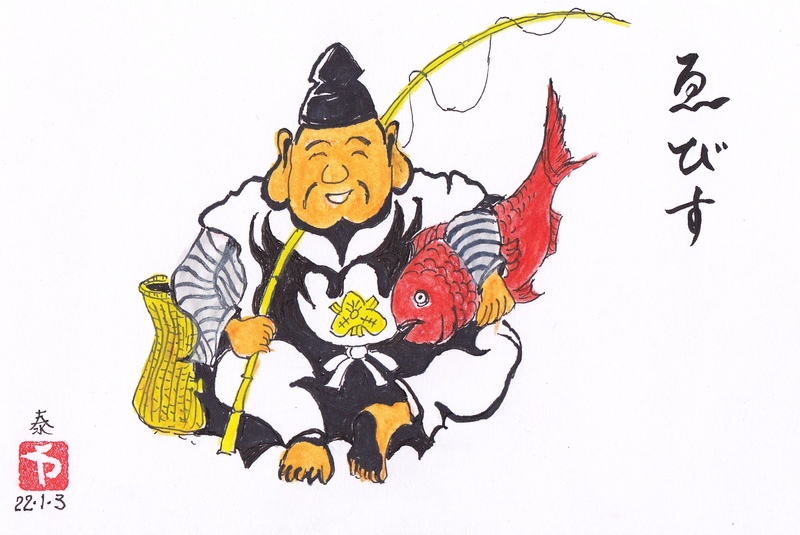 The only one fish kamon we found is “Taki ni Koi” (carp swims up in the waterfall), its meaning is “succeed in life”. (perhaps in the late Edo period or in the Meiji period – the 19th to 20th century), long after the civil war was over. I believe my husband’s family crest is a takanoha with the feathers crossing. However, there are many versions with some having a circle around it some crossing right over left and vice versa. Would you be able to clarify the correct kamon for me? His last name is Ikeda and his family originates from Kitakyushu. Hi M, thanks for the comment! who has given its name from Prince of Emperor Seiwa. The family crest “Maru-ni-chigai Takanoha” (丸に違い　鷹の羽), hawk feathers crossing, left on the top with a circle is most likely your kamon. They also used another crest, “Ageha-cho” (揚羽蝶), the swallowtail butterfly which Oda Nobunaga used as well. Also, in Saga Prefecture in Kitakyushu, there used to be the “Ikeda Castle” which built by Ikeda family around the 14th and 15th century, but there is not much information about them. So we can’t really relate this family to yours. Thank you very much for the thorough information and for the speedy reply. This is an amazing service which you provide. You are so much welcome, M.
Thanks for the compliment;-) We are really glad you found it helpful. I am hoping you will be able to help me again. I am wanting to verify my maiden family crest. I believe it is four diamond shapes formed into one larger diamond shape. It is for the Yukawa family who are from Kobiki in Wakayama. Also, I think I remember my grandmother telling me that is is customary for the women to continue to utilize their maiden family crest rather than their family crest which they married into to. Can you verify this custom? Do you have the image of your family crest (perhaps some kind of Hishi-mon)? And yes, there’s a custom female line inherits the crest independently from generation to generation. So from grandmother to mother, mother to daughter, and to grand-daughter… There’s a certain crest succession on female line aside from the male one. The form of this custom vary in regions but the overall concept is the same. So daughter can use both her mother’s crest and family (father’s) crest as well. Also, one can choose which one to use. I believe it is some form of the Kimura or Matsumae or Kyogoku crest you have pictured above in your blog. I know that it is four squares (or perhaps diamond shape) formed into one square (or diamond) with dots in the middle of each square. I don’t know if the point is at the top or if the flat side is the top. I also am not sure if there is a circle surrounding the four squares. I hope this is helpful. Is this the crest of your maiden family? Oh, sorry for that. This is the link you can download the Maru-ni Sumi-tate Yotsume. If you have any trouble seeing this file, please let us know. Hi , I’m looking for Aoike family crest ? Let us ask you to clarify your family name. Is it “Aoike” (青池) or “Aoi-ke” ( Aoi family – 葵家)? Then, let us get back to you with those two possibilities later. Ok , thank you , I’ll be waiting to see what you find out . On my grandpa side there is samurai in the family , maybe that will help out a little ? SERVANT H , I see you research for lots of other people , why do you do this , or whats in it for you ? We research by the request because that’s where our interests are in as well as other themes we write. My Aunt Toshiko wrote it down Aoike , maybe that helps ? I see. Perhaps your family name should be “青池” (Aoike which means blue pond). We’ll search your family crest with this one. We found out your family name is very rare but there is a lineage which we think it is your family roots. The family name “Aoike” has its origin to “Omura” (大村) family of Nagara lineage in Hizen-no-Kuni (present Saga/ Nagasaki region). It’s considered that “Omura” family has its roots to Nakatomi-no-Kamatari (Fujiwara-no-Kamatari) who was given its family name from Emperor Tenji. Omura family crest is “Omura Uri”　（大村瓜）. The file name we attached below says “Arima Mokkou” but it is originally “Omura Uri”. Omura and Arima families were merged by adoption in the course of the time, so some call it that way. Although the Uri means a cucumber, the original design came from the pattern of bird’s nest we see from above, which represents the prosperity of descendants. They ruled the Omura domain (present Omura city in Nagasaki Prefecture) in the Edo period (1603- 1868). Your aunt Toshiko-san might have been known some family member or relative from that region? Thank you so much , I really appreciate your service. I have one more question ? Sure, go ahead with your question. I was told that that my family name Aoike has samurai blood . Is there anyway of telling by the name Aoike or the crest symbol ? Yes, Aoike’s roots of Omura family was ruling Omura domain, which means they were Samurai. In the Edo period, there were numerous domains and each of them was ruled by Samurai family. Yes , thank you ! SERVANT H , I’m just curious , what country do you live in ? We live in the states now. May I ask you what did make you curious about that? No reason , just very curious , I live in Texas . Your family name “Hara” from Saga/ Nagasaki region (previous Hizen-no-Kuni 肥前国) has its roots in Hizen-Matsura family (肥前松浦氏). Their family crest is called “Matsura Mitsuboshi” (松浦三星) or “Matsura Boshi” (松浦星), which is one of the star-designed crests. In feudal Japan (roughly from the end of the 12th to the end of the 16th century), they consisted of a navy. At the time of the Mongolian Invasions (of 1274 and 1281), clans out of Hizen-Matsura family played an active role to defend the nation. Stars played a remarkable role in the Nara and the Heian period (710-1185) for its astrology and spiritual value. 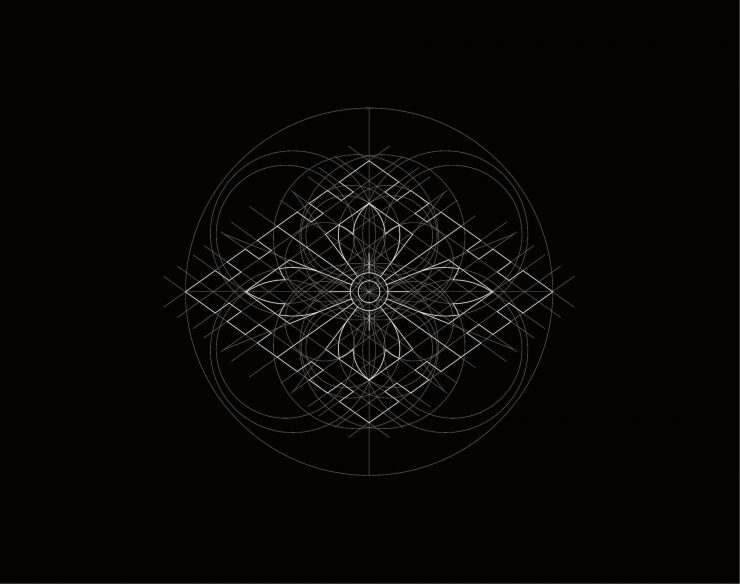 The simple circle design is perceived as a star in Japanese family crest realm. Its design was popularized by the Samurai (warrior) class for its good omen and simplicity. I absolutely love this discussion on the differences in the Kamon, and I’m looking forward to picking up some of the book resource that you provided in your post! Especially the Japanese Design Motifs book! I was wondering if you could help me with the Maternal side of my family. I know the Paternal side (Takeuchi) has the Kamon of the Yotsume, but I’m struggling with information for my Grandmother’s side of the family. My grandmother’s birth name is Atsuko Mochizuki, her father was Iwakichi Mochizuki. 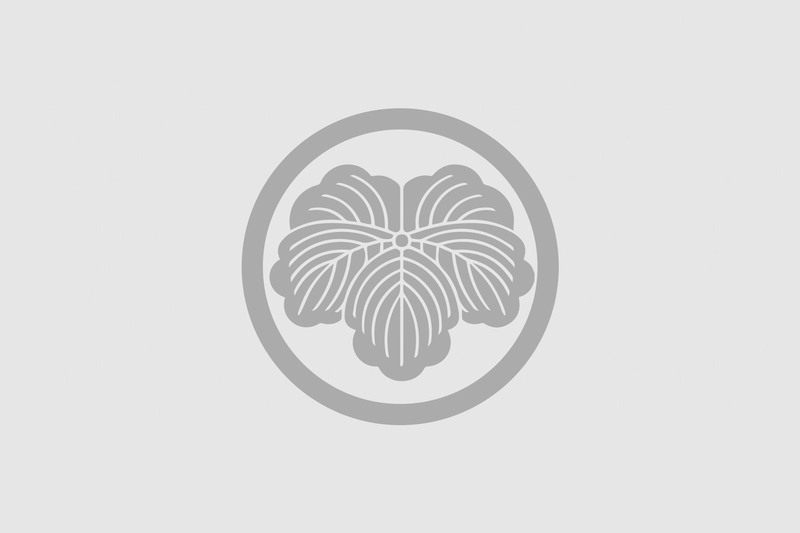 I’m having a terribly difficult time locating the Kamon for the Mochizuki family, including the name of the Kamon and the history of the family itself. Hi Cerin, thanks for the comment! We are really glad that you enjoy our discussion. 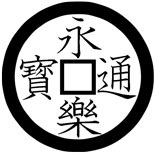 Mochizuki family crest is “Kuyo” (九曜) – nine stars. It was believed to work miracles on road safety, so they put this crest on vehicles like an oxcart in the Heian period. In 865, the ritual “Komahiki” was originally performed on August 29th rescheduled to perform on August 15th, the full moon (満月/望月 – Mochizuki). It was one of the events of the Imperial court that many clans offered their horses to the court. The horses (uma) which offered by Shigeno-uji called “Mochizuki no Uma”, who was the major contributor and later clans which took over its job to take care of horses were given the family name “Mochizuki”. Thank you so very much, it is incredibly helpful. My Grandparents don’t speak much about our family, and I’m trying to help maintain records and information for myself and my cousins as much as I can during my free time. I have a strong interest in my family background and a desire to further understand the culture that I was born to, but wasn’t necessarily directly taught. My grandparents and their families were in the camps during WW2 and so they stopped passing down cultural information and traditions due to that experience, so my cousins and I don’t have a lot of history and I’m trying to recover that for us. Your help with this is tremendous! Thank you! We are really glad that you found it helpful and so grateful for you sharing your family history with us. We’ve launched the consulting service http://www.patternz.jp/product/kamon-consulting/, so we may be able to help you further there. Anyway, we are so happy you have begun the first step of finding your family roots. Hi! I’m looking for my family’s mon. Our last name is Uraisami, my grandma said she thinks it’s two hawk feathers crossed…any info would be much appreciated! Hi Adam, thanks for the comment! Your family name “Uraisami” (浦勇) is quite rare, however, perhaps your ancestors came from Wakayama prefecture, Osaka or Hyogo prefecture since the name originated from Wakaura Bay, Wakayama city, Wakayama prefecture. There was a sumo wrestler who used “Uraisami” as his ring name in Hyogo prefecture, people might have adopted the name since the Meiji period (1868-1912). Since it’s relatively a new family name, there is not much information which we can relate to your kamon. However, since your grandmother told you the kamon is two hawk feathers crossed, let us share the information about it. “Chigai Taka-no-ha”, two falcon feathers crossed crest, is a pretty popular kamon which has been used among many daimyo (feudal lords) and direct retainers of the shogunate in the Edo period (1603-1868). One of the samurai families which used “Chigai Taka-no-ha” is Asano clan, since one of its base ground was Kii-no-kuni (present Wakayama), you may be able to claim it is the origin of your family crest. 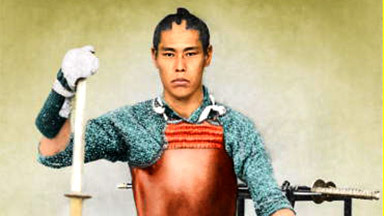 During the feudal period, military officers display falcon feathers at the side of their headgear. Also, several shrines such as Aso and Higo shrines adapted the crest as their shrine crest, prodiving a religious dimension stressed by many families who later used it as their family crest. Hi. I am a 3dr generation Japanese Canadian. My grand father’s name was kametaro mori and was from Wakayama ken, Japan. I noticed there are two Mori family crests, one with a crane and one with three circles stacked in a pyarmid and a line over top. I was wondering if you would have some insight as to which one of the crests we might belong to. Hi Dennis, thanks for the comment! First of all, let us clarify is your family name 森(Mori) or 毛利(Mouri)? The one with a crane is called “Tsuru-no-Maru” which belongs to 森 “　Mori” family (the offshoot from Seiwa Genji). It’s a representative kamon for Mori family name. The one you mentioned as three circles stacked in a pyramid with a line over the top belongs to 毛利　”Mouri” family (not Mori). Yes our family name is spelled Mori and knowing that the crane is the Kamon is much appreciated. i’m a sansei who’s grandparents came to US from Fukuyama, Hiroshima. My grandmother Koume Komaru’s ancestors own a large mountain and property in the area. I’ve been told they were aristocratic. Any information would be greatly appreciated…. very curious about our moen as I would like to pass on to our future generations. Hi David, thanks for the comment! The family name “Komaru” is relatively rare and it has its roots in Komaru-mura (village)小丸村, Mikuni-gun (county) 美含郡, Tajima-no-Kuni 但馬国 (the present northern part of Hyogo Prefecture). We can spot Komaru-san mostly in Hiroshima and Hyogo Prefecture today. Unfortunately, we couldn’t find out its related names which can be traced back its roots and related Kamon (crests) by the name. But do you happen to know any other information about your grandmother’s ancestors? Since you’ve been told they were aristocratic, by that means they were descendants of the courtiers, but not samurai class? Historically, the area called Bingo Fukuyama-han (domain) (備後福山藩)　was ruled by Mizuno family, Matsudaira family, and Abe family in chronical order since the Edo period. There is a name “Abe Masatake” on the decoration list of the nobility as he was given countship credited for the work in Hakodate war　(1868- 1869). Any information you happen to get, please let us know! I have my family kamon from our family grave but would like to find some more information on meaning, origin and/or history since my grandmother claims that my great grandfather was a high ranking samurai. His name was Yugo/Jugo/Jougo (don’t know spelling of first name) Tsukahara, Tokyo. It seems to be a common one. Do you know where can I find more information? Hi Asahi-san, thanks for the comment! The family name “Tsukahara” has its roots in Tsukahara-mura (village), Kashima-gun　(county), Hitachi-no-kuni　(province) which is a large part of present Ibaraki Prefecture. The related name, Daijo clan which is an offshoot of Kammu-Heishi (one of the Taira family) which were descendants of Emperor Kammu. Also, the name can be seen in Seiwa-Genji (one of Minamoto family) which were descendants of Emperor Seiwa. There are many “Tsukahara-san” in the eastern part of Japan. The family crest you provided us, “Maru-ni-Mokkou” (丸に木瓜), is the second most used Kamon in Japan. The famous feudal warlord Oda Nobunaga used it as well. The design originally came from the patterns which courtier used on their costumes, reed screens, and ox-drawn carriages since the 7th century. It’s considered to be stylized from a cross-section of a Japanese quince or the circular placement of a bird’s nest. Below pic shows Mokkou-mon on a reed screen at Yasaka Shrine　（aka Gion-san）, which enshrines Susanoo no Mikoto　(deity of warding off of evil). Its meaning is wishing for the prosperity of descendants as it looks like a bird’s nest embraces the eggs. Before the name was given, the design has been used a lot on “Mokou” (ornament) on the reed screens at shrines which enshrine Susanoo no Mikoto, so people began to call it “Mokkou” while using kanji characters “木瓜” (Japanese quince). Some say that the descendants of Prince Arima, son of Emperor Koutoku, began to use Mokkou-mon in the 7th century, others say Saneyoshi Tokudaiji was the one first one who used it since 1156. Lastly, is your great grandfather’s first name is Masayoshi (昌義), commonly known as Jugoro (重五郎)? He was a direct retainer of the Edo shogunate, born in Ushigome, Edo (present Tokyo). He once came to the states as an envoy in 1860, fought the Boshin War (civil war) in Japan, and exiled himself to the states in 1869. Wikipedia (only in Japanese) says there’s an article dated June 17, 1869, which covered him in San Francisco Chronicle. I would be interested to know if there was more than one kind of crest for the Ishida family name. I unfortunately do not have any specific information to go off of. Thank you! Hi, Ishida-san, thanks for the comment! That’s a good question you asked us if there is more than one Kamon attach to the family name “Ishida”. The answer is YES! We can trace back its roots to the descendants of Emperor Suinin who resided in Ishida, Kuze-gun, Yamashiro-no-Kuni (present Kyoto Prefecture) around the 1st century. In the medieval times, the family name “Ishida” began to be seen all around Japan. Miura of Kammu-Heishi (one of the Taira clan), resided in Ishida-go, Ozumi-gun, Sagami-no-kuni (present the central and western Kanagawa Prefecture). Ishida-mura, Sakata-gun, Omi-no-kuni (present Shiga Prefecture) which produced the famous feudal lord, Mitshinari Ishida, who used a distinctive coat of arms as his personal signature on the battlefield called “Daiichi-Daiman-Daikichi”. Although, the representative Kamon of this lineage are Kuyo-mon (Nine Sun) and Narabi-ya (Arrows). Thank you so much! This is a great starting point I can use to find out more when I get more specific information. My mother’s maiden name is Terashima. She was from the Amori prefecture. Would you know of this name having a kamon? Hi Sandra, thanks for the comment! The family name “Terashima” has several roots, so it has many Kamon as well. Please keep in mind that each of the related family names has more than one Kamon but we present you here the main one of each for your reference. Kammu-Heishi (One of the Taira clan) has roots in Shimousa-no-Kuni, Katsushika-gun, Terashima-mura (present Chiba Prefecture) and its representative Kamon is Ageha-cho (Swallowtail Butterfly). Seiwa-Genji (one of the Genji clan) which were descendants of Emperor Seiwa and its representative Kamon is Sasa-Rindou (Bamboo Leaves and Gentian). Uda-Genji (one of the Genji clan) which were descendants of Atsuzane-Shinno (son of Emperor Uda),　its Kamon is Sumi-tate Yotsume-yui. If you have more specific information about your family roots, we may be able to narrow down your Kamon. I am very impressed with your reply to my inquiry. I will try to find out more specific information from my Father and get back with you. It’d be more exciting once we have more information, which can give us a specific direction to look into. Hello, my daughter needs an image of a family mon (family crest), for a Japanese Culture & Heritage Summer School. We are looking for an image for the Nomura family mon. Can anyone help me? Hi Hamby, thanks for the comment! The family name “Nomura” has several roots, so several different kamon attaches to it. We may be able to narrow down the candidates if we could know where your family came from (Province or Prefecture). Anyway, here are possible kamon of “Nomura” which derive from related family names. Hope it would be helpful for your daughter’s summer school! I am also looking for my father’s family crest Ikeda. Hi Cristy, thanks for the comment! There are many kamon candidates for your family names. Here we go! First, about the family name “Fukumoto”, one root is in Mimasaka (present Okayama Prefecture), Taira clan and Sugawara clan which names were given by Emperor Kammu. A Swallowtail Butterfly for Taira, Umebachi (Plum) for Sugawara. Other roots can trace back in Higo province (present Kumamoto Prefecture), Nakatomi-no-Kamatari was given the family name “Fujiwara” by Emperor Tenji. A Hanging Wisteria. Another family name you are looking for, “Ikeda”, its roots can trace back to several areas and figures such as Yamato-Takeru in present Osaka Prefecture and Okayama load, “Ikeda”, which was given by Seiwa Emperor in present Gifu prefecture. Possible candidates are Butterflies, Mokko, Kikusui (a combination of Chrysanthemum and Water). I am looking for the Fukumoto crest. The family name “Ujihara” has its roots in Shinano (present Nagano prefecture) that Nakatomi no Kamatari was given a family name “Fujiwara” Hidesato clan by Emperor Tenji. The family name “Yoshikawa” originally comes from the southern family of “Fujiwara”. As a result of the Jokyu Rebellion (1221), they were given the land of Aki province (the present West part of Hiroshima) and ruled there. 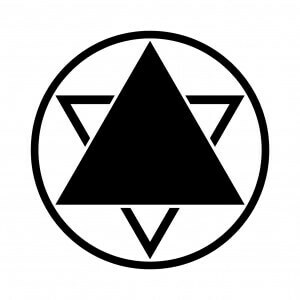 Their kamon is called “Mitsuhiki Ryo”. The another family name “Yamauchi” or “Yamanouchi” originally comes from “Shuto” clan of “Fujiwara” that turned to be Samurai. After the Onin War (1467-1477), they became the strongest lord of Bingo province which is the East part of present Hiroshima. Their kamon is called “Mitsu Kashiwa”. Since you have told us your family comes from Shobara, which is located in the northern east part of Hiroshima, our best guess is the kamon “Mitsu Kashiwa”. Kashiwa is Japanese Emperor Oak, its leaves are large, soft, and flexible, which don’t fall until the new leaves come out even after they are dead. 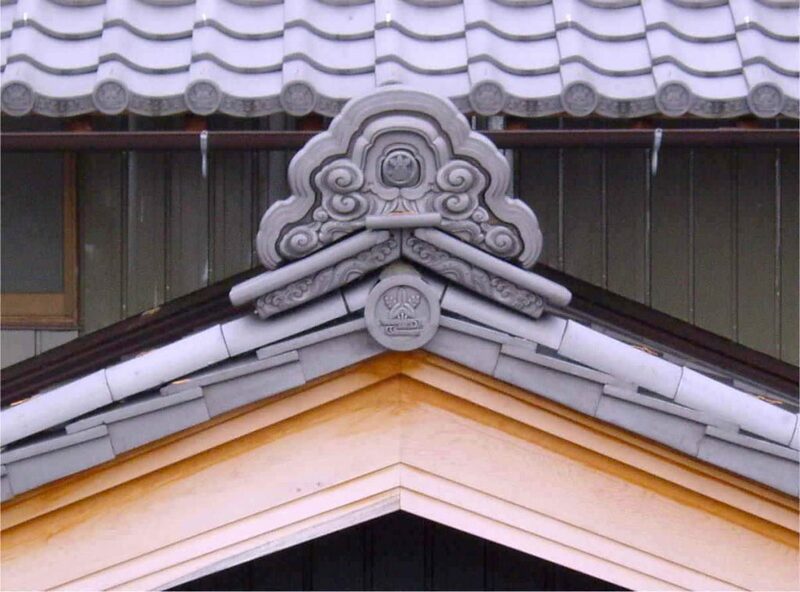 This feature related to long-live family and gradually some shrines adopted its design as their crest. It’s been considered that “Yamauchi” family began using “Mitsu Kashiwa” in relation to Chiaki family of Atsuta Jingu (shrine). wow! thank you so much for your research in my family name. it’s greatly appreciated. i plan on sharing with my entire family!! Hi from Canada! I’m doing some beginning research on behalf of my husband’s extended family. His family name is Hoyano, and I have a scan of their family crest. They’re related to another family of Japanese origin, named ‘TSUJIURA’ but no one appears to know of any crest. I am unsure of their origins in Japan, but thought it’d be worth asking if you could point me toward some resources… Thank you in advance! Thanks for the comment, Melanie! What we can get to know from the family name “Tsujiura” is there are relatively many Tsujiura-san in Osaka, Aomori, and Mie. But no reference for other related family names or samurai family names, hence no clues. Kamon does not necessarily relate to family names and there’s no record on a family register. Even you can create your own family crest yourself. One sure way to know your family crest is to visit your family’s gravestone. There should be the Kamon inscribed on them. Hi. I’m looking for an Okino family crest. Might you have information regarding one? Thanks for the comment, Okino-san! Do you know some portion of the design of Okino family crest? Or any other information about your family’s origin, previous family lineage? When we do not have any Samurai relation to the family, it’s sometimes difficult to sort out what the exact Kamon looks like. My family is from Hiroshima. Also, we believe there is a flower (sakura) in the crest. Thanks for the information, Okino-san! The family name “Okino” is seen a lot in Ishikawa and Hiroshima. The related family name is “Oki” clan, which uses 花輪違い (Hanawa-chigai). Usually, we may be able to trace back its root in Seiwa-Genji (Minamoto clan), which uses 桔梗 (Chinese bellflower) or Sasaki clan of Uda-Genji (Minamoto clan), which uses 結目紋 (yuime-mon), Murakami-Genji, which uses 竜胆 (gentian) or Fujiwara clan, which uses 藤 (wisteria). 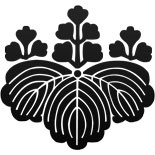 Considering the fact that your family crest has sakura in it, we couldn’t really pin down which one is the exact one, still, our best guess is 花輪違い (Hanawa-chigai) of Oki clan or Seiwa-Genji’s Chinese bellflower Kamon. Their flowers are not sakura, though. Please take a look. 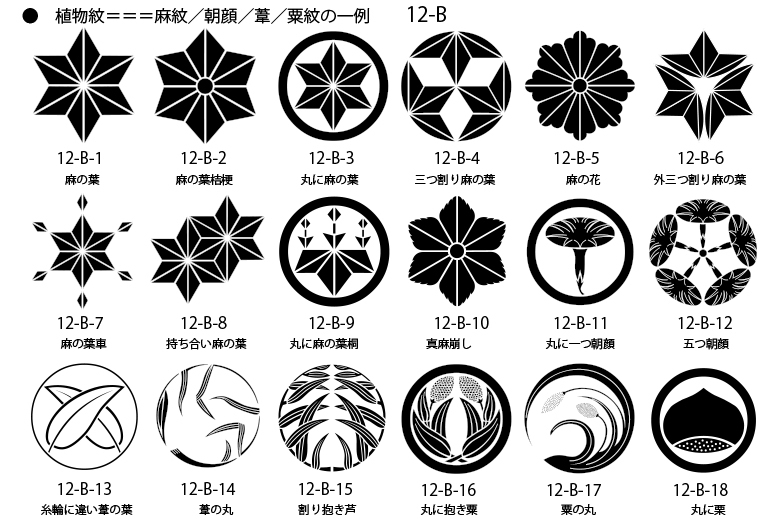 We attached the list of Sakura flower Kamon for your information. I am looking for my family Kamon. Last name is Yamazaki . My family is from Saitama. Hi, Sandra. Thanks for the comment! The most famous Samurai Yamazaki family’s roots, Uda Genji Sasaki family, comes from Omi Province (now Shiga prefecture) and it’s considered spreading around Capital area, which includes Saitama prefecture such as “Maru ni Sumitate Yotsume” below. However, there are much more Kamon of Yamazaki such as below. If you can find where did your family come from before Saitama, we could narrow down the possible candidates. I have what I believe to be a genuine katana with an unusual symbol on its Hibiki, I think it might be a Kamon. I was wondering if there was any way I could send you a photo of the symbol in question and possibly find out what on earth it is. Hi, Kiri. Thanks for the comment! Yes, please send us the photo of its Habaki from our contact page. Then, we can work from there! Hi, Martha. Thanks for the comment! I am looking for my mother’s family mon. It is three fish scales in a circle. I think it is called maru ni san roku. Do you have a picture of it? Hi Alfred, thanks for the comment! Perhaps this is the one you are looking for. It’s called ” Maru-ni-Mitsu-Uroko”. Hope this is your mother’s family mon.